Following the success of the first leg of the campaign in Canada, activities are about to continue over the Greenland ice sheet in a few days. This includes two teams from the UK that will living and working in central Greenland for the following six weeks. The first team, led by Prof. Liz Morris from the Scott Polar Research Institute at the University of Cambridge, is already on the ice. Liz will be travelling by Skidoo from Summit Station down to a refuelling depot called simply T21. Liz has been measuring snow and firn density over the Greenland ice sheet for several years using a neutron scattering probe. This instrument was originally designed to measure soil moisture, but has actually been very useful for measuring the bulk density of snow. The work done by Liz has extended the snow accumulation record to 25 years. On 29 April, our team (Santiago de la Peña and John Pailthorpe) will be uplifted by a Twin Otter to a site known as T21. This a refuelling depot, located at about 2600 m above sea level on central Greenland. 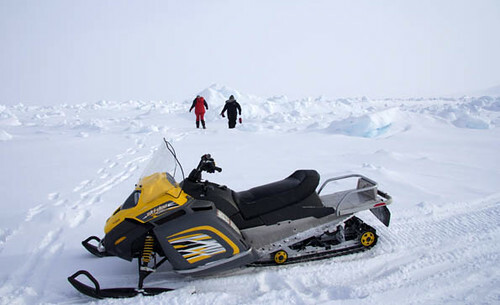 Here, we will meet with Liz for a couple of days before she leaves the ice sheet, leaving us two skidoos. We will ski down to a site located at an elevation of 2000 m, and then start our traverse that will take us to Summit Station, at 3200 m for 25 days. We will literally be living in the ice, under constant katabatic winds and temperatures ranging between –30 and –40° C. By the end of our little expedition, we will have travelled 600 km and surveyed more than 20 sites. We will be using a Very High Bandwidth ground radar, which operates in a similar fashion to SIRAL and CryoSat’s airborne equivalent ASIRAS, making snow density/stratigraphy measurements, taking infrared photography of snow structure, and assessing snow melt over the percolation zone of the ice sheet. So what is so important to make us want to spend a month in such a harsh weather? Well, for starters, measurement of snow density is crucial to interpret elevation changes as estimated by CryoSat in terms of mass change, and thus, fresh water input to the ocean and sea level rise. Changes in the surface elevation of the ice do not necessarily produce changes in mass (for instance, seasonal densification may cause a negative elevation change, but no change in mass. Likewise, water from rain that refreezes in the snow, add mass to the glacier, but do not cause elevation changes). The second objective is to characterize the radar response to a wide range of snow structures found over Greenland. This is a crucial step for the interpretation of SIRAL signals, since the penetration depth of radar signals varies depending on snow structure, melt and accumulation. The above images show ASIRAS profiles taken over the percolation zone of Greenland. Subsurface ice layers reflect radar signals better than the snow at surface. Overall, we are very optimistic of the outcome of our expedition and, personally, I can’t wait for work to start next week. I wish you the best of luck, Santiago!